Today we celebrate the birthday of a most iconic lady. Having peeked in at her death, walked in her shoes, strummed her harp and even witnessed her marriage, today I offer a look at a small fragment of cloth. It might seem unremarkable but it is, of course, a fragment of a court dress petticoat that once graced Marie Antoinette. 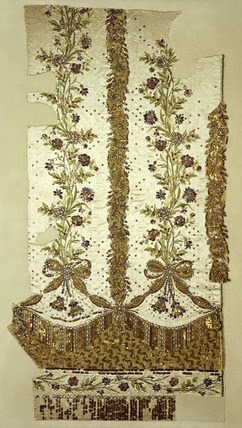 This pretty, silk satin fabric is reputed to have been brought to England by a Monsieur Besnard, who was employed in the maintenance of the Bourbon wardrobe. A loyal retainer of the queen, Besnard was the advance guard of sorts and when the winds of Revolution began to blow, he was sent to settle in England. Here he awaited the queen's expected escape from France, safely armed with some choice items form her wardrobe. After all, when Marie Antoinette escaped from France and set up home across the Channel she would, of course, want something suitably regal in which to gad about. Of course, that escape never came and Besnard and the royal wardrobe awaited the queen in vain. Rather than England, ornate petticoats and freedom, Marie Antoinette went to the National Razor, with no need whatsoever for frocks as ornate as the ones that had been squirrelled away for her. A heartbroken Besnard cut up the gown in his care and handed out the pieces to loyalists in memory of the late queen. The fragments of cloth were treated as though they were holy relics, treasured memorials to the doomed monarch to be cared for and held in trust. Though the majority of the pieces are unaccounted for this one survives in the care of the Museum of London, a tantalising glimpse of a beautiful garment and a lost age. Probably the rest have been in the hands of descendants of the émigrés. Although at some stage they might have been used for dust rags. Dust rags? The very thought. I like to think little cushions and pouches for precious keepsakes. I much prefer the keepsake option, but suspect some ended unhappily! It must have been a really pretty petticoat. Ooh yes, what a gorgeous petticoat it must have been!